Find hotel near Temple Of The Sacred Hear .. The Temple del Sagrat Cor or the Church of the Sacred Heart is popularly considered Barcelona’s version of the Sacré-Cœur in Paris. 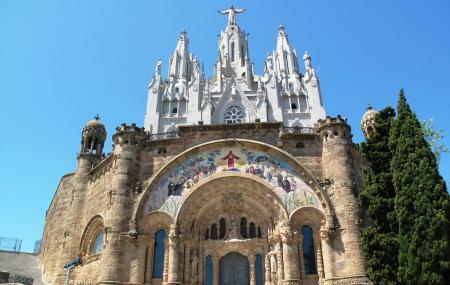 Set atop Mount Tibidabo, the church overlooks the entire city and offers stunning views. The architecture of the church is a mix of modernista and neo-gothic design elements. At the top of the church is a large statue of Jesus made in bronze and is reminiscent of the Christ the Redeemer statue in Rio. There is an elevator that takes visitors to a viewing platform. The church also looks spectacular when lit up at night. If you take the metro to get here you will need to switch over to the funicular for the final leg. The church also conducts mass on weekdays at various times. How popular is Temple Of The Sacred Heart Of Jesus? People normally club together Cosmocaixa Barcelona and Museu Nacional D'art De Catalunya while planning their visit to Temple Of The Sacred Heart Of Jesus. Stunning view over Barcelona. Surprisingly there is a great amusement park at the top of the mountain. Go late afternoon during summer as it will be boiling hot standing in line for some attractions. Visit the temple and take the lift and stairs up to the Jesus Christ statue at the top of the temple and you will have a world class view. From the amusement park you can get a great spot for photos in the attraction right at the entrance which will take you high up in the air between the temple and the city view. Amazing! A great place to get one of the best views of the city. You can do a hike up there or take a bus. The church it's very nice and you can go up to the towers to get even a better view. A really awesome place! Not sure why it wasn’t more people here? Great spot especially if the weather is good. 3,5 euros inside to take the elevator up in the tower all the way up almost to the statue. So worth it! Amazing Catholic Basilica in Tibidabo hill, Barcelona. This is a tourist destination with complete facility. Many cyclists ride from downtown to this place. I was fortunate to experience it as well. Beautiful view from above!